Family Man - Notes: 280-289. 280. Oma is pretty old-school about her weird bush religion. Clever Folk and Wise Folk (and guide and strap, sorry everybody) are some terms we’ll see lots of going ahead. Hey, have we noticed that Milena is wearing a leather thong around her neck, as Ariana has for some of her past trips to the woods? 282. Poor Luther. Poor library. 284. Spats! Not just for dandies. 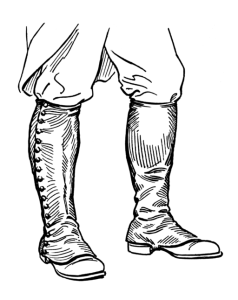 The English word comes from “spatterdash,” which is pretty self-explanatory; in the 18th century they were indistinguishable from what we’d now call gaiters – knee-high coverings originally designed to keep mud off of soldiers’ boots. 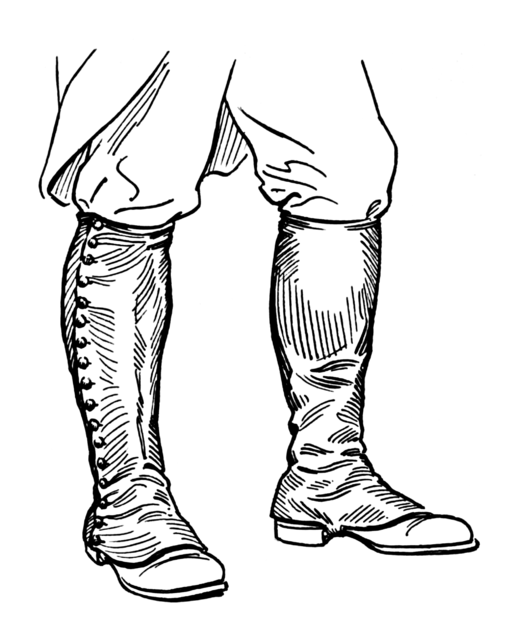 Spats/gaiters became much more common in the 19th century and evolved into the fancy little white shoe-covers that went out of fashion during the Great Depression. Luther and the Rector are both wearing theirs now that the weather has turned slushy. Protective shoe-coverings are a fascinating (to me, anyway…) little subtopic in utility fashion throughout history. I’m very fond of pattens, a sort of platformed over-sandal popular from medieval times into the modern era. Before indoor plumbing, consistent paving, rubber shoe-soles, and municipal sewage and waste services, streets were often covered in several inches of smelly, poop-laced mud and decomposing waste, sure to ruin your kicks. At the door of your house, you’d slip on pattens over your nice shoes and clop into the mucky streets with impunity. Then you’d kick them off at the doorway of your destination and step in with your footwear intact. Pattens were also used indoors to ward off the chill of some stone floors. 285. “Helping my mother all those years” – you can guess here that the midwife in the room with Ariana’s mother in the intro the Chapter 1 was Milena’s mother. 287. Dammit, I kept forgetting that Ariana was wearing her wolf hide in this scene, so it’s randomly vanished in the first panel. I hate continuity errors! It’ll be fixed for the print edition. Christ’s encounters with women – I’ve touched on this before (as has Rector Nolte). Jesus has direct conversation with several women over the course of the various Gospels. Beyond his various female followers (and his mother), the ones who have speaking roles are the woman who touches his garment, the woman accused of adultery, the woman at the well, and the Canaanite woman who zings him. A few others touch him, are healed by him, or otherwise react to his presence, sometimes quite powerfully, but aren’t named or given dialogue. Worth noting is how many of the women who put in appearances were in some way socially “unclean” – either as Gentiles, or as Jewish women of less-than-perfect marital virtue or suffering from reproductive system afflictions, or impoverished widows. 289. “Doppelgänger” literally translates as “double-goer.” The folkloric or mythical theme of a person having a double is rarely a good thing, often presaging death or illness, and the term has only recently come to mean something as innocuous as a stand-in or a lookalike. Technically this word wasn’t in use yet, apparently being coined much closer to the end of the century, but we’ll let Ariana have it.